Art student and monster's apprentice Karou finally has the answers she has always sought. She knows who she is—and what she is. But with this knowledge comes another truth she would give anything to undo: She loved the enemy and he betrayed her, and a world suffered for it. In this stunning sequel to the highly acclaimed Daughter of Smoke & Bone, Karou must decide how far she'll go to avenge her people. 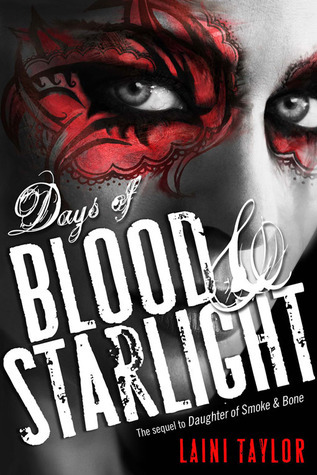 Filled with heartbreak and beauty, secrets and impossible choices, Days of Blood & Starlight finds Karou and Akiva on opposing sides as an age-old war stirs back to life. This series is one that I could go on and on about for hours at a time. It is one of the best that has ever been written in my opinion, and I have yet to read the last book. I have no doubts at all that my opinion will only be reinforced once I have the chance to read Dreams of Gods and Monsters. While I would love to ramble on and on about all of the ways in which I am blown away and amazed by Days of Blood and Starlight and its predecessor Daughter of Smoke and Bone, I won't. "Why", you may ask (Or maybe it is a YAY, no rambling!). I fully believe that this is a series that you need to go into blind. No knowledge at all, except what you get from the synopsis. It is just better that way. The magic of the places and worlds and history in the story, the amazingly relate-able and incredibly well-written characters are something you want to discover on your own. Take chocolate, for instance. I could sit down and describe to you the richness and the creaminess and smoothness of a Hershey's bar or Snickers or Three Musketeers. Tell you exactly what that first bite tastes like, the sweetness with the hint of bitter if you like dark chocolate. Sure, it may make you interested, but my descriptions would be nothing compared to you taking a big old bite of it for yourself. That is exactly what Days of Blood and Starlight is like. A good old piece of chocolate. Perfection! So, no descriptions, no what I liked or didn't like. There was nothing that I did not like. Just a very sure and basically pleading recommendation that you go out and buy a copy of these books or get them from your local library. Hopefully, when you are finished with it, you will love the book as much as I do. And really want to give Laini Taylor a high five and a thank you, for giving us Karou and Akiva and Issa and Brimstone and Zuze and Mik and the chimaera and angels! Now, I am going to work on getting my hands on the final book. Soon, hopefully! And I will be back with another odd, chocolate talking review about it, too. Or maybe Dr. Pepper or coffee talk next time! Oh good review.... leaving us intrigued. I very much loved the first book and I am hoping to get this book soon. I actually went in blind when i first started reading the book, it helps that it had such a gorgeous cover upfront, so i decided to see if the cover did the book justice at all..... I did.... And now I am excitedly waiting to get the 2nd and 3rd book in the series. I hope that you are able to get yours hands on both of them as soon as possible! I am glad that my review intrigued you, but it still did not do justice to this amazing book. If you loved book 1 as much as you seem to, I have no doubt this one will blow you away! Thanks for the comment!